THE PICKIEST EATER IN THE WORLD: I'VE LANDED ON PANCIT PLANET! Once again, I'm writing this with a disclaimer of forgiveness for my pictures that are not up to par with my other posts. I didn't have Rina's camera with me, so I had to rely on my trusty Galaxy S2, which I believe did an admirable job, nonetheless. Camera or no camera, I couldn't resist writing about my latest delivery discovery for the people around the Makati area (for now).. I place that took the concept of everyone's favorite merienda, and took it to new heights. Ladies and gentlemen, this is Pancit Planet. I had first heard about Pancit Planet through my foodie friends Direk Pedring and Cody, because they often order it for their clients, or just pain old food trips at their office, "WeLovePost". I'd check out their Facebook page from time to time, and I was really impressed with their concept. It was so simple, yet awesome at the same time. If you were to choose the "National Merienda" of the Philippines, Pancit would undoubtedly be in the forefront of your choices. Pancit Planet plays with that notion, and pimps it up a bit, turning what was supposed to be an ordinary plate of Pancit, and turns it into a "Pancit Topping" meal. If you go to almost any restaurant around the Metro, there's a huge chance that you'd find a "rice topping" meal in their menu. 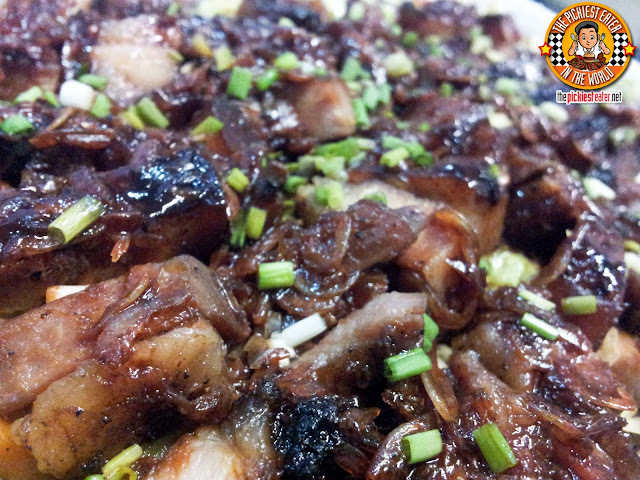 Choices can range from Sisig, Liempo, to Chicken Inasal. 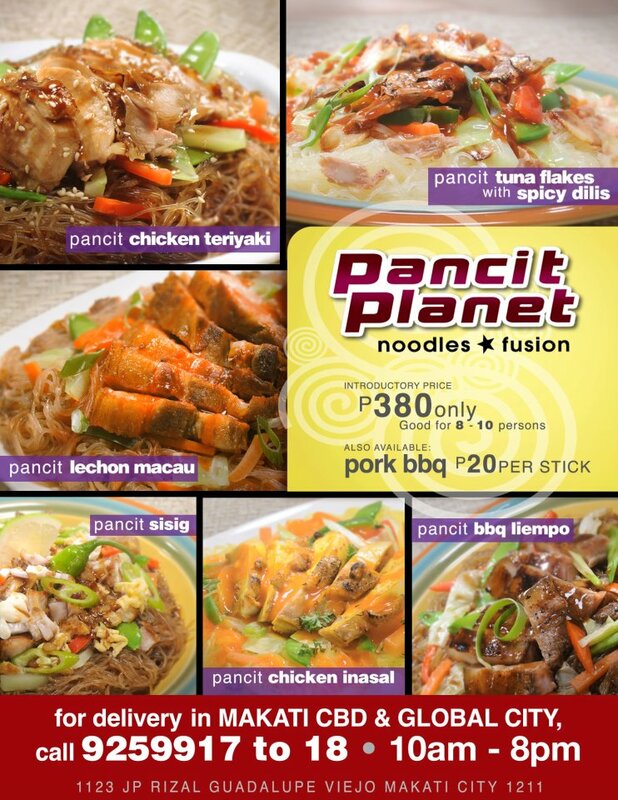 The brilliant minds behind Pancit Planet thought to themselves, "Why can't we do this with Pancit?" Pancit Planet doesn't have individual sized meals, but what they do have, is trays that can feed up to 10 people (Well, I'm one of those 10 people, better make it "good for eight"). 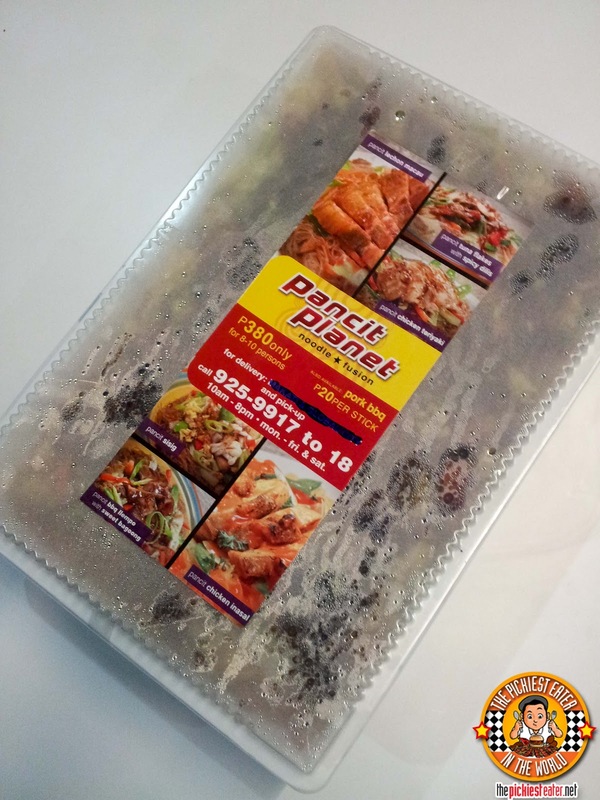 The trays are then topped off with the flavor of your choice..
As of this writing, Pancit Planet has six Variants available.. Liempo with Sweet Bagoong, Lechon Macau, Chicken Inasal, Chicken Teriyaki, and Tuna Flakes with Spicy Dilis. 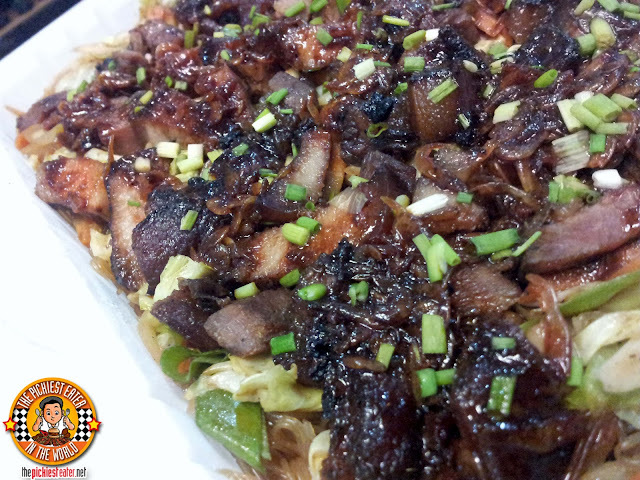 Chicken Teriyaki and Inasal on TOP of Pancit? Pure Genius! Can you guess what I ordered? hehe.. It was actually a toss up between The Liempo and the Lechon Macau, but the Liempo won in the end (Epic battle though.. you should've seen it hehe). The liempo was quite delicious. It had a nice sweetness to the meat, and it was grilled just enough so that a dark burnt caramelization was on the edges, but the meatiness of the pork wasn't lost. The Bagoong (Shrimp Paste) wasn't too overpowering for me (and I'm not the biggest fan of bagoong either.. I can stand it though). It was actually a nice compliment to the meat. 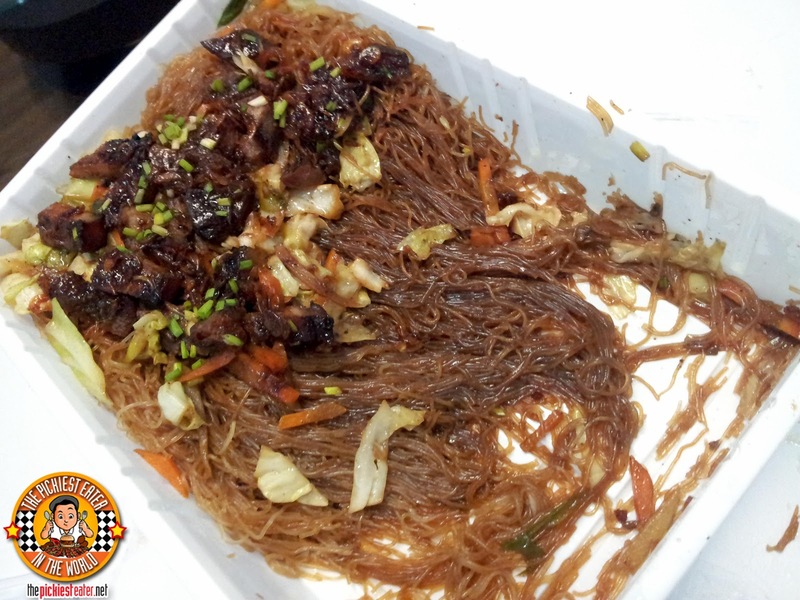 Pancit Planet uses "Bihon Guisado" (the thin glass noodles) for their pancit. Though I prefer the thicker Canton/Hofan variety, It was pretty hard to find fault in this. The noodles had a beautiful springiness to it, as it held itself firm when scooped up with your fork, but wasn't too "gummy" when chewed. 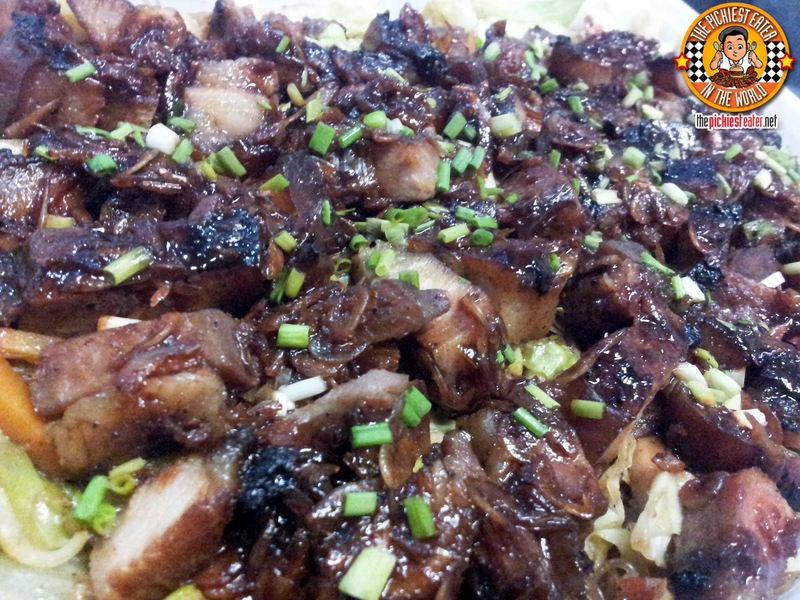 It also had been enraptured by the flavor of the liempo, so every bite packed a punch of pork in it, even without the actual meat. Another thing I like about Pancit Planet was how huge the servings are. This is how the tray looked like after around 10 people ate, getting generous servings from it (9 actually.. I went back twice.. I ordered it, so it was my divine my right hehe). It took around three more people to finally polish this bad boy off, and everyone was left really stuffed. And the carbs didn't seem to bother anyone. Comments I got were, "I would eat this with rice!" and "Can you imagine how good this would be in between hot pan de sal?" This is a great deal at P380 for an entire tray, perfect if you're in the office or at home and you're expecting guests over, or if it's your birthday and everyone is clamoring for Pizza and Spaghetti! The Pancit is now available in Small & Medium sizes! (If you're from PostManila, then you know exactly what I'm talking about). 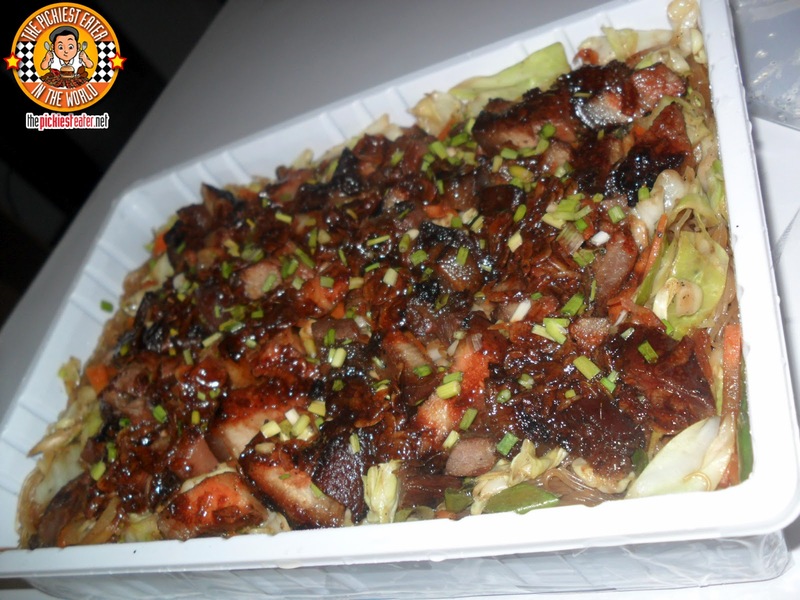 Delivery can extend up to Pioneer, Ortigas Business Center, & Mandaluyong near Makati. All other areas can be available upon request, depending on location and time of delivery. wow!!! I want!!! Nakakainggit coz i love pancit also. Then you're gonna love this, cookies! share your post when you do, michy! See ya on sunday! Diet, what diet?! :)) But, seriously this looks good. And it's affordable too. haha di mo naman kailangan mag diet, pachuchie! Ooh, I need to tell my dad about this. 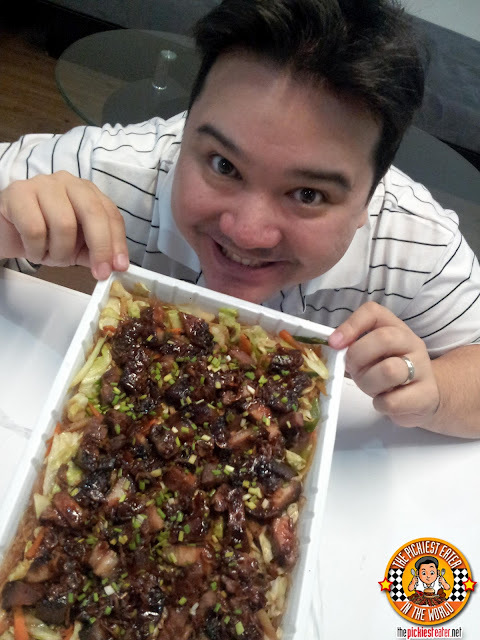 He is an absolute pancit fan! i Hope he enjoys it, Karen!